The Grand Duke Charles founded this Order in 1812, on the anniversary christening or namesday of his consort, Stephanie of Beauharnais (niece of the Empress Josephine). He named the Order after the Ducal House of Zahringen, the ancestors of the reigning family of Baden. The badge is a golden Cross, the intervening spaces of which are joined with golden clasps, while the green enamel in the middle of the obverse represents the ruins of the original castle of Zahringen in a round field with a golden ring (No. 9). The reverse shows upon a similar field of red colour a lion rampant in gold. The Grand Master is the Grand Duke ; the Order has four classes ; Knights of the Grand Cross, and Commanders of first and second classes, and Knights. The Princes of the House of Baden are born Knights of the Grand Cross. The number of the members is unlimited. 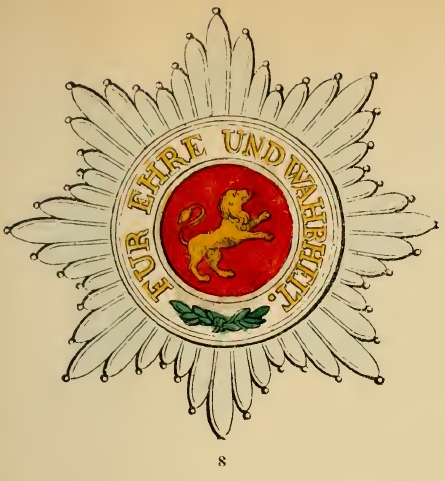 The Order is worn by the Knights of the Grand Cross across the right shoulder by a green ribbon with orange coloured borders, accompanied by an octagonal silver star; the round red scutcheon in the middle contains a golden lion in a fighting position, with the inscription : "Für Ehre und Wahrheit" (For honour and truth) (No. 8). 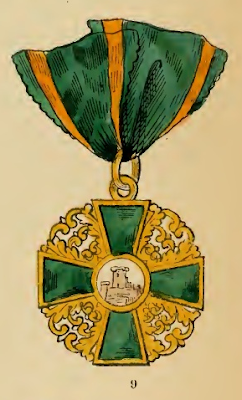 Knights who are already in possession of the Family Order of Loyalty, wear a Grand Cross round the neck. The Knights of the first class wear, besides, a square silver star with the Cross of the Order upon it, and surrounded by a red ring, with the above inscription. The simple Knights wear the decoration at the buttonhole. 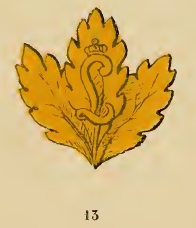 As a particular distinction, the decoration of the Commanders and Knights is often adorned with an oak leaf (No. 13). This is the case since 1826. The first chapter was held three years after its foundation, in 1815, at the time of the Vienna Congress. The size of the Cross varies with the different classes.